Smart pipelines are now seeing a new generation of sensors that are seamlessly integrated into the pipeline itself. New pipelines will come alive with big data flowing as quickly as the fuel pumped through it. This next generation Micro-Electro-Mechanical Systems, or MEMS may be the future, but existing pipelines can be retrofit with sensors too, both external and internal to the pipe. Natural Resources Canada reports that there are more than 840,000 kilometres (km) of transmission, gathering and distribution pipelines in Canada — including 117,000 km of large-diameter transmission lines — with most provinces having significant pipeline infrastructure. Of this amount, about 73,000 km are federally regulated pipelines, which are primarily transmission pipelines. Pipelines are generally buried underground and operate in both remote and populated areas, with major crude oil and natural gas pipelines servicing most major Canadian cities. Generally, pipelines that cross provincial borders are regulated by the federal government, and pipelines that are entirely within one province are regulated by the respective provincial authority where they are located. Provincially regulated lines include the smaller natural gas distribution pipelines that go to every house equipped with a natural gas furnace or water heater. For example, there are more than 450,000 km of these local distribution pipelines in Canada. Therefore, the need for a means to tightly monitor these pipelines has never been greater. Once a rupture occurs, action is needed to stem the flows of product and stop the leak. A network based upon the Internet of Things (IoT) is the sort of advancements necessary to better management pipelines. Why? 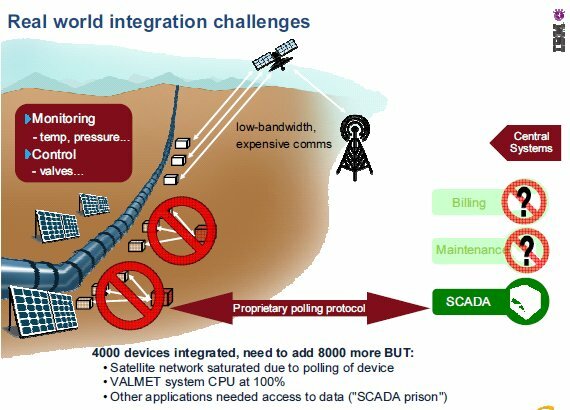 Because the current older technology SCADA based solutions are too sparely deployed and a more granular solution is needed to bring a keener focus to the performance of the pipelines. SCADA also has limited functionality and IoT can bring a myriad of sensors to bear to monitor a multitude of aspects that are not normally seen by SCADA. With a SCADA system, we connect at major points in the pipeline and monitor flow and perhaps control automated valves and adjust pump pressures. With IoT we can distribute the monitoring all along the pipeline to provide a comprehensive picture of pipeline performance. Used with SCADA with IoT adds even more value to the solution. Here is an example of sensor types that are available today and can be used to provide deeper insights into the performance of a pipeline. Temperature – A pipeline is subject to both internal and external temperatures. The sun might heat up a pipeline and friction caused by the flows may create heat internally. Sensors can measure internal and external temperatures to 1/100th of a degree to reveal deltas and provide evidence of anomalies. Humidity – Humidity is defined as the amount of water vapour in an atmosphere of air or other gases. The most commonly used terms are “Relative Humidity (RH). Solar Radiation – Often used in conjunction with temperature sensors, solar radiation sensors detect the sun’s light and measure the nanometer wavelengths of the colour temperature, hours of radiation, angle of radiation, and broadband variations. A pyranometer is a type of actinometer used for measuring solar irradiance on a planar surface and it is designed to measure the solar radiation flux density (W/m2) from the hemisphere above within a wavelength range 0.3 μm to 3 μm. Pressure – Pressure sensor is a device that senses pressure and converts it into an electric signal. Here, the amount depends upon the level of pressure applied. These sensors make it possible to create IoT systems that monitor systems and devices that are pressure propelled such as pipelines. With any deviation from standard pressure range, the device notifies the system administrator about any problems that should be fixed. Vibration – Vibration sensors can be used for predictive maintenance of rotating machines such as motors, pumps, compressors and fans. Of all the gases emitted from a pipeline, methane is considered to be the worse since it cannot be seen nor tasted, yet it is considered to be the second biggest worldwide cause for global warming and the destruction of the atmosphere. So, detecting leakage from pipelines is not only economically smart, but also critical for environmental protection. Analog to Digital Adapters – Since most pipeline already exist, and they are old builds, they still use analog gauges. New IoT sensors are now bolted-on to these gauges to read values and convert them to digital signals for seamless integration of the old with the new technologies. Impurity and Contaminate Detection – Sensors can be used to detect foreign objects and material build-ups within the pipeline. Wax build-up can affect flow rates and create undue pressure in the pipe. Detection can provide insight for cleaning the pipeline with a PIG and then measure the cleanliness after the cleaning. Valve Actuation – SCADA has been monitoring and controlling valves for decades, now IoT integration with digital values for precision accuracy can be performed. Video as a Sensor – Image sensors are instruments which are used to convert optical images into electronic signals for displaying or storing files electronically. The major use of image sensor is found in digital camera & modules, medical imaging and night vision equipment,thermal imaging devices, radar, sonar, media house, Biometric & IRIS devices. Infrared – An infrared sensor is a sensor which is used to sense certain characteristics of its surroundings by either emitting or detecting infrared radiation. It is also capable of measuring the heat being emitted by the objects. Accelerometer – Accelerometer is a transducer that is used to measure the physical or measurable acceleration experienced by an object due to inertial forces and converts the mechanical motion into an electrical output. It is defined as rate of change of velocity with respect to time. Gyroscope – A sensor or device which is used to measure the angular rate or angular velocity is known as Gyro sensors, Angular velocity is simply defined as a measurement of speed of rotation around an axis. It is a device used primarily for navigation and measurement of angular and rotational velocity in 3-axis directions. The most important application is monitoring the orientation of an object. LiDAR – Drones flying over the pipeline, equipped with LiDAR (Light Detection And Ranging) inspection is a better, faster and more accurate technology to use for analyzing the shape and condition of a pipeline. Compressor Health – new compressors are being manufactured with tightly coupled IoT sensor technology built into the device and provides significant situational awareness to the health status of the compressor. Acoustic and Harmonics – Detecting sounds and the combination of sounds to derive harmonics is becoming popular in many industries including pipelines. Pipelines ‘sing’ and changes to this song can be indicative of problems and tell operators of issues such as cracks, breaches, and ruptures. The sounds from pipelines can even be subsonic or ultrasonic compared to human hearing but sensors can hear it and understand its consistency. When it varies, this change demands investigation to determine why it varied acoustically. Proximity – A device that detects the presence or absence of a nearby object, or properties of that object, and converts it into signal which can be easily read by user or a simple electronic instrument without getting in contact with them. Photoelectric – Photoelectric sensors provide non-contact, accurate detection of targets. They emit infrared, red or laser light and switch to an output state if a target interrupts the emitted light. These units come in three primary types: through-beam, retro-reflective and diffuse. These sensors can check for presence, color, distance, size, shape, and many more applications. They perform at longer distances than alternative sensing methods, while offering many mounting options and the ultimate in flexibility. Laser – Laser distance sensors are used for precise distance measurement, down to the micrometer at diverse ranges. Movement – Movement sensors create new possibilities for non-contact detection and the measurement of moving surfaces. The optical movement sensor is compact and designed to detect when surfaces are moving or not. It is ideal for both drive shaft and conveyor applications. The optical movement sensor combines movement sensor functionality with advanced surface scanning technology, to provide speed and length measurements in both x and y direction via incremental outputs. Contact – Contact sensors are developed to detect the impact of parts as small as 0.3 g.
Magnetic Field – Magnetic field sensors facilitate the safe detection of high electronic current. A typical application would be monitoring pipeline grounding problems. Radar – Radar sensors are used in different applications for non-contact detection of objects. This mode of operation allows for concealed mounting behind a protective wall, enabling the detection of any movement through the wall. These radar sensors distinguish between approaching objects and objects moving away, up to a distance of 6 meters. The sensors can be adjusted to mask small objects in favor of large ones. Ultrasonic – Ultrasonic sensors are used in automation tasks for distance measurement and as proximity switches. The sensors use sound/time measurement that ensure reliable detection, regardless of color. Transparent objects, liquids and powders can also be reliably detected. These sensors are insensitive to dirt, so they can be applied in environments where optical sensors would fail. Internal Sensors – Smart PIG – Depending on the model, smart pigs detect cracks and weld defects through magnetic flux leakage or shear wave ultrasound, mechanically measure the roundness of the pipe to detect crushing, or measure pipe wall thickness and metal loss through compression wave ultrasound. We are yet to see the full potential this technology carries, as the whole platform is becoming smarter through the fusion of all the aforementioned sensors. When you consider the fact that all of the measured data is collected and can be analyzed, it is obvious that IoT is going to become even smarter in the future. Photo credit: Luca Galuzzi. Section of the 800-mile Trans-Alaska Pipeline. Photo credit: Unknown. Sentinel Analytics. Graphic Credit: IoT devices – sensors and actuators examples – source IoT infographic Postscapes and Harbor Research – CC Attribution license.